I like soups that don’t require the use of broth. I’m not very good at keeping a constant supply of homemade broth in the freezer, and I’d rather not use the store bought variety if I can help it, so any soup that is delicious just by virtue of the vegetables included deserves closer attention. 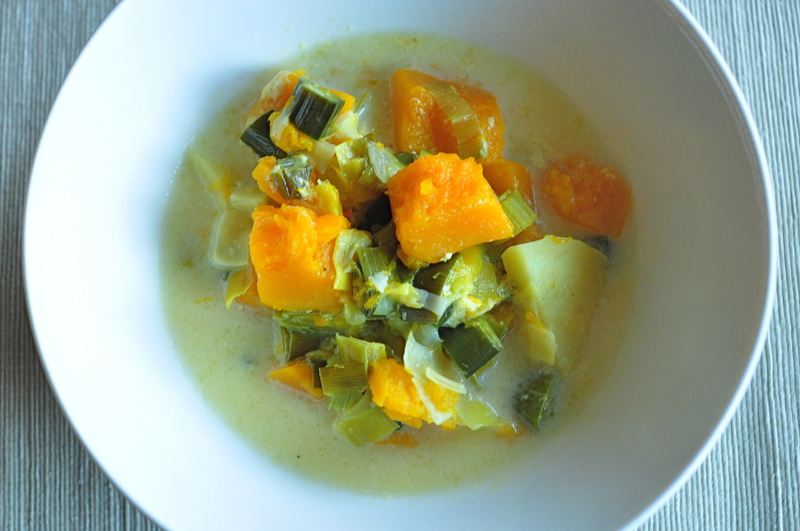 This pumpkin leek soup is adapted from a recipe by French chef Paul Bocuse featured in a German-language cookbook my grandmother passed on to me quite a while ago. A lot about the cookbook, which is from 1985, seems dated — the style, photographs, clunky dishes, desserts just a bit too sweet. But there are a few gems, including this pumpkin soup. It has just five ingredients (and no broth!). Cut off leeks’ dark green outer leaves and wash under running water to remove dirt. Cut into 1/2 inch (1 cm) slices and wash again in cold water to eliminate the remaining grit. Remove skin and seeds from squash and cut into 1 inch (2.5 cm) cubes. Peel potatoes and cut into 1/2 inch (1 cm) cubes. Melt butter in a heavy-bottomed saucepan, add leeks, and let sweat for about 4-5 minutes. Add potatoes and squash, milk, and enough water to reach the top layer of vegetables without covering completely. Season with salt and pepper and let simmer partly covered for 30 to 40 minutes, or until the vegetables are soft. Check and adjust seasoning, and serve with crème fraîche if desired. Like most soups, wait until tomorrow and it will taste even better.